← How to convert files of AutoCAD to svg? This article is to introduce an application that can convert pdf to word with Optical Character Recognition (OCR). Application PDF to Word OCR Converter is a powerful application that can recognize the words and sentences in a scanned pdf document with advanced OCR technology. Nowadays, more and more documents are created in electronic mode and stored as digital documents. Many old documents that are stored in paper are also scanned and saved as electronic documents. Portable Document Format (PDF) is a popular file format for storing electronic documents. To scanned PDF documents, the words and sentences are stored in raster images, which are not editable in the future. 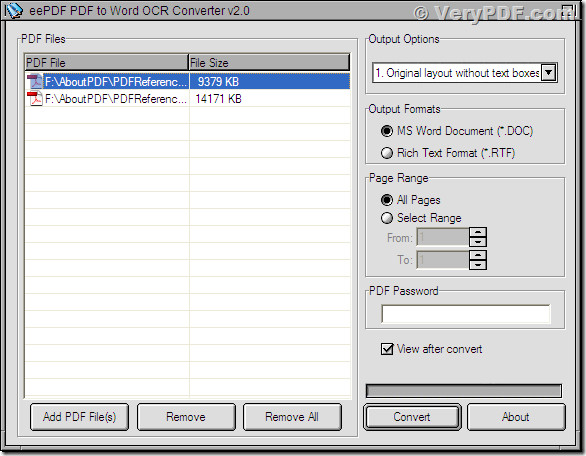 Use PDF to Word OCR Converter, you can extract the words and sentences in a scanned PDF documents to a Microsoft Office Word document. This application is free for trial, and you can download it via http://www.eepdf.com/dl.php?file=eePDF2WordOCR.exe to evaluate the function. If you would like the full version of the application, you can buy a license to register the application through URL http://www.eepdf.com/pdf-to-word-ocr-converter.html . The following screen snapshot is from the main interface window form of the application. You can see that there is a file list in the left part of the form. The application support convert multiple PDF documents in a batch, and those PDF files in the file list will be converted in one single process. You can add/remove some items to/from the file list with pressing buttons [Add PDF Files], [Remove] and [Remove All]. In the right part, there some options for the conversion. In group box “Output Options”, you can set the output mode for the conversion in the dropdown list. There options like “Original layout with text boxes”, “Text only (No Image)”, “Flow text without text boxes” are for converting textual PDF documents. For convert scanned PDF documents with OCR, please select those “OCR PDF…” options. In group box “Output formats”, you can set the target format of the converted file. “MS Word Document (*.DOC)” is to convert the pdf to doc (Word), and “Rich Text Format” is to save the pdf to rtf (Rich Text Format). Group box “Page Range” is for setting the page range of which the pages will be converted. “All Pages” means to convert all pages of the pdf file to word or RTF. “Select Range From X to Y” is to convert selected pages in the range to word or RTF. If the pdf file is protected by a user password which prevents being opened, please input the text box of “PDF Password”. Box “View after conversion” is to command the application to open the converted file automatically with the associated viewer application. 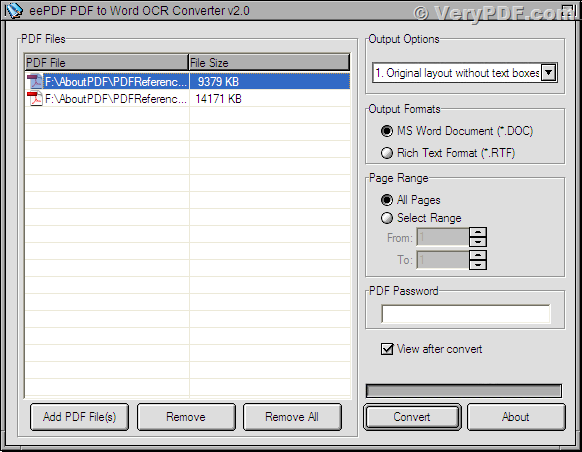 After finishing all the preparation work, press button [Convert] to convert your documents of pdf to word or RTF. If your PDF documents are from scanning paper documents, the OCR technology will extract those words and sentences into the new created word or RTF files, and then you can edit and copy the words and sentences freely. The application is light and handy but powerful. It can convert you scanned pdf to word or rtf fast and accurately. If you want more information about this application, please visit http://www.eepdf.com/pdf-to-word-ocr-converter.html. This entry was posted in PDF to Word Converter and tagged OCR, PDF to DOC, PDF to RTF, PDF to Word. Bookmark the permalink.